If Mattel had made Barbie dolls in 1903, Christy Mathewson might have been the model for Ken. One of the "Five Immortals" elected when the Hall of Fame was established in 1936, Mathewson was called "Big Six" because his fastball reminded reporters of a famous New York fire engine. Nevertheless, it was his fadeaway (screwball) that drove National Leaguers crazy. He won 30 or more games four times, finished 434 of the 551 games he started, and completed 10 of 11 World Series games while posting an ERA of 1.15. A control whiz, he pitched 68 consecutive innings in 1913 without walking a batter. Born to well-to-do parents in Factoryville, Pennsylvania, Mathewson studied forestry at Bucknell, headed two literary societies, was elected class president, and was the kicker on Walter Camp's 1900 All-America team. 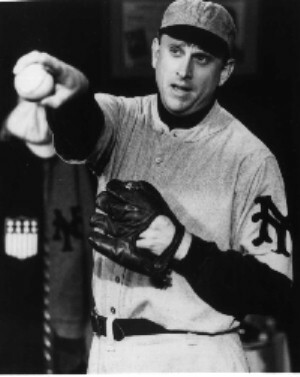 He became a Giant that fall, won 20 games in 1901, and became baseball's dominant pitcher starting in 1903, the first of three straight years when hewon 30 games or more. In the 1905 World Series, Mathewson became a household name; in a Series decided entirely by shutouts, Matty contributed three-in five days. He four-hit Connie Mack's A's in the opener and, two days after Chief Bender blanked the Giants, four-hit the Mackmen again. Two days later Matty wound up the Series, giving up six hits this time, but nevertheless pitching his third shutout in six days. In 27 innings, Mathewson walked one man and stuck out 18. 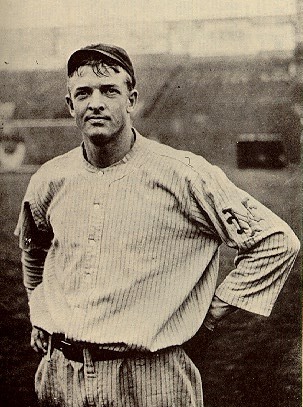 Over the next ten years, Mathewson won at least 20 games a season. When the fadeaway began to fade, Mathewson's manager and best friend, John McGraw, arranged a trade to Cincinnati so he could take the helm of the Reds. Joining a chemical warfare unit in France during World War I, he was accidentally exposed to poison gas that weakened his lungs; he later contracted tuberculosis, which ultimately proved fatal. He had served as general manager of the Braves despite his poor health but died on the opening day of the 1925 World Series.